Knee High [G1589] - $8.00 : Yarn Tree, Your wholesale source for cross stitch supplies. Cross stitch pattern by Hands On Design. If this design doesn't scream summer in the country, I don't know what does! The beautiful flag quilt is hanging on the fence with the big red barn standing in the background. It's a hot July day & the corn is knee high! 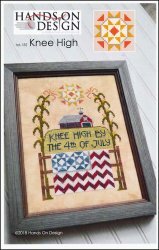 "Knee high by the 4th of July," is stitched above the fence with the quilt. Stitch count framed 91 x 126.